The photograph was torn in half and I do not know where the other half is. There are several hand written names on the back that have, unfortunately, faded over time. I'll attempt to decipher them: Bob Palino of Boston, MA; Richard McHugh or Richard M. Hugh; Winston Lacasse of Colchester, VT; William Walsh of Charlestown, MA; Raymond Miller of Buffalo, NY; Laney/Lany or Lavey Chappin; Roland Raymond or Roland R. Raymond of Blackstone, MA; Robert Cilley of Charlestown, NH; a couple guys are labeled as Chic or Chick on the front. 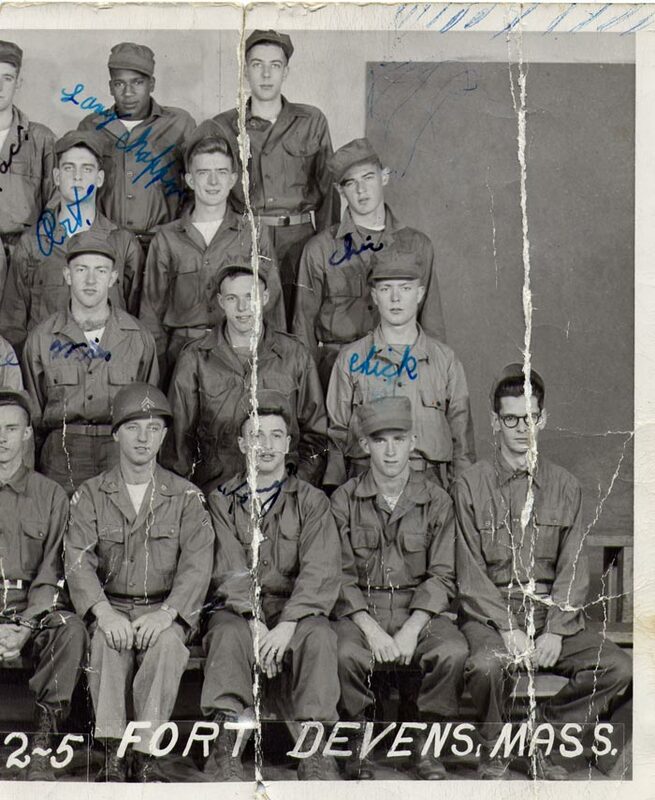 My father, Ray McCrave, is in the front row, second in from the right side and seated directly in front of Chick.